HALL Crown & Anchor game. Coins are handmade SCA. Dice are Koplow. I have been unable to dig up a lot of information on the matter of Crown & Anchor, which I find curious considering its international popularity and diversity. It is still popular in Bermuda during the local cricket Match Cup (the only time it is legal), and can be found in online casinos as well. Stake-board games are a type where markings of dice or other gaming objects are depicted so that a bet may be placed upon it. This may mean a wooden board, a piece of fabric, or even impromptu images drawn in chalk or on the ground. They became popular in Europe in the fifteenth century, with games such as Glukhaus. *Chuck-A-Luck: Casino Sweatcloth using a dice cage. *Anker en Zon: Flemish version with a sun instead of a crown. *Ancre, Pique, st Soleil: French name for Flemish version. *Hoo Hey How: China. Fish, prawn, crab, rooster, gourd, coin, butterfly, maiden, etc. *bầu cua cá cọp: Vietnam. Fish, prawn, crab, rooster, gourd, and stag. *Langur Burja or Khor Khore: Nepal. Ornate Crown & Anchor dice with a flag instead of anchor. 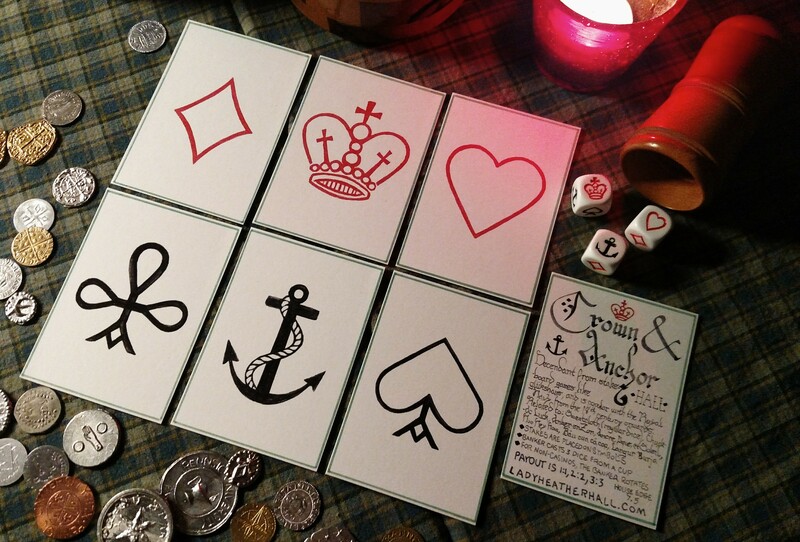 Do you have a way to purchase the crown and anchor set you pictured? Very interested.